A healthy Mario Edwards Jr. has proven to be a productive piece within the Oakland Raiders’ interior defensive line this season, especially against the run. Among 3-4 defensive ends with 100+ run snaps in 2017, Edwards ranks No. 2 in run stop percentage (11.7) and No 3 in total run stops (17). To add perspective, none of the other 3-4 defensive ends on the Raiders’ roster have amassed more than seven run stops this season, nor has one recorded a run stop percentage north of 5.9. Edwards’ dominance, however, shouldn’t come as a surprise to those that have followed him closely, for it only adds legitimacy to his strong play at the start of his NFL career. The former second-round pick (2015) led all Oakland 3-4 defensive ends in run stop percentage (9.6) as a rookie before being sidelined with a combination of hip and neck injuries after Week 15. Unfortunately for the Silver & Black, Edwards’ injuries lingered deep into his sophomore season, keeping him from the gridiron for all but Oakland’s final two regular season games and their Wild Card matchup against the Houston Texans. In said contests, he flashed his former dominant self, totaling three run stops on just 31 run snaps to record a 9.7 run stop percentage. 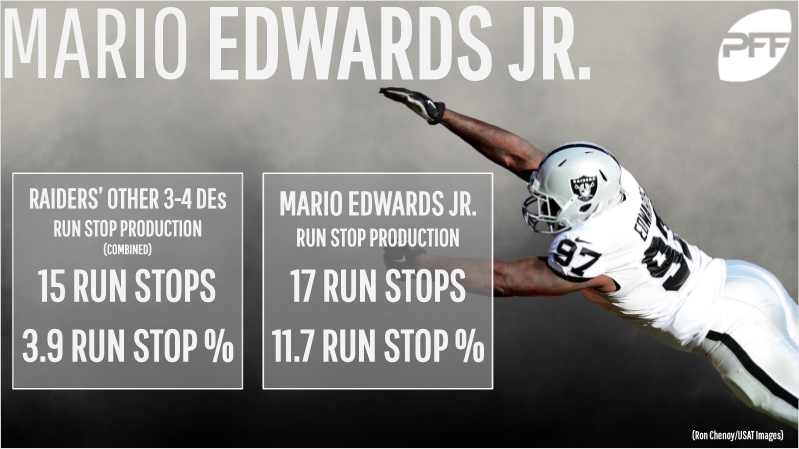 Having successfully avoided the injury bug’s bite following the Raiders’ loss in the postseason, Edwards has since taken his career to new heights in 2017. In addition to his run stop numbers, Edwards owns a 79.0 run defense grade and has earned a 70.0+ run defense grade in six of his nine games this season. Edwards’ return to form and edge defender Khalil Mack’s continued supremacy against the run has kept the Raiders’ defense from falling to the depths of the league, as Oakland’s defensive unit ranks T-No.15 in the NFL in yards allowed per carry (4.1) through nine games in 2017. 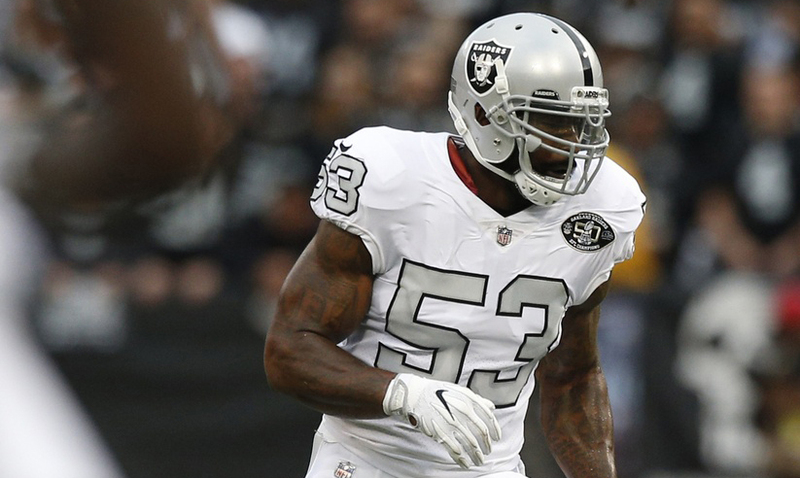 Similarly, the duo’s work in the trenches has had a positive impact on veteran linebacker NaVorro Bowman’s ability to make plays in the run game. Since joining the team in Week 7, Bowman has recorded a 79.1 or higher run defense grade in all three of the games he’s suited up with Edwards & Co. Conversely, in his six games with the San Francisco 49ers at the start of the season, Bowman put together just one performance of that nature. His run stop percentage has also improved by 1.5 percent since crossing over the bay. Extending beyond just Bowman’s play, the Raiders’ linebacking corps is on pace to have 17 more runs stops than their Malcolm Smith-led unit in 2016. While the entirety of the improvement can’t be placed on solely Edwards’ shoulders, his healthy presence is, by all means, a contributing factor.